I’ve recently returned from spending four weeks in Ireland. Here are some of my favourite photos from the trip. I would love to return to Ireland and photograph a wedding there. I adored Dublin, but I’d also love to see more of the country. Contact me for no travel fees on my full day wedding photography package if you’re getting married in Dublin or elsewhere in Ireland. This is probably my favourite photo I took on the whole trip. This was taken on the Monday of the last week I was there, on a tour with Barratt Tours to the cliffs of Moher. I had the hardest time shooting the rows of cliffs with the bright sunlight and insane winds. This is one of the few photos I took that actually came out as I’d intended it. I think the biggest part of my love for this photo, though, is the memories. I met some really interesting and friendly people on that tour, which was greatly welcomed with me being all alone in a foreign country for the first time. And for the first time on that trip, I really felt relaxed and at home. The next few images are from the tour as well. Below is a rocky shore on Galway Bay. Reminds me of a lot of the beaches on Vancouver Island. I loved all the similarities I found between Ireland and my current home in Victoria. It made me fall in love with my home a bit more. This is the street I was staying on in Georgian Dublin. I rented a self-catering apartment at Latchford’s for a great price. It was a nice, old building and the people were really friendly and accommodating. I’m still a fan of those colourful Georgian doors. 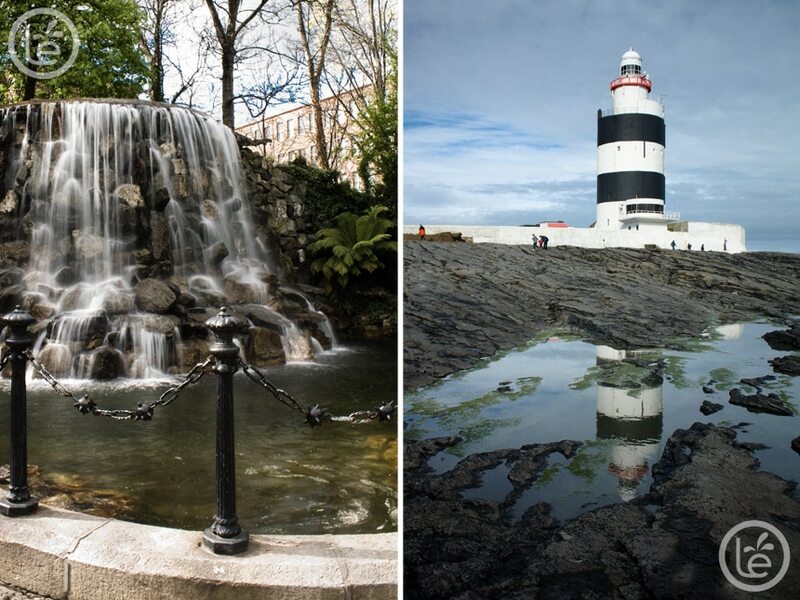 The following photos are a waterfall in Iveagh Gardens, sort of hidden away north of St. Stephen’s Green in Dublin, and Hook Lighthouse on the south coast of Ireland. I visited Kelly, one of my favourite people from university, in her new home in Wexford, and finally met her Irish fiancé Simon. Simon gave us some history lessons as he showed us around Wexford and other areas in the “sunny southeast”. It was a lot of fun, and I didn’t take many photos because I was so caught up in catching up with my friend. Now I wish I’d taken some portraits of the two of them. Maybe if I can somehow get to Ireland again next year for their wedding.